1. A copy of the book or a preview marker. With the book in hand, open the read page. Allow betweenpageandscreen.com to access your webcam. The image from your webcam should appear on screen. When you see yourself on screen, open the book to the first page with a marker on it. Hold the pattern up to the camera so that the entire black square is visible on screen. The poem should appear. If you have trouble, please continue reading for more detailed help. Make sure the entire black marker is on screen. If part of the marker is offscreen or obscured by your hand, the software will not be able to "see" it. Don't curve the marker. If the marker curves, its lines are no longer square and the software won't recognize it. Make sure there's enough light. There should be enough light that the difference between the white page and black marker is crisp. In low light, it could be difficult for the software to pick out the marker. In the video above, Amaranth explains how to use Between Page and Screen and describes common problems. 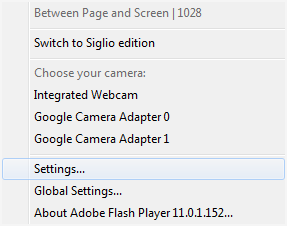 The Flash plugin and a webcam are required to run Between Page and Screen. Flash is a free download from Adobe. Most laptops come with a webcam installed above the screen. 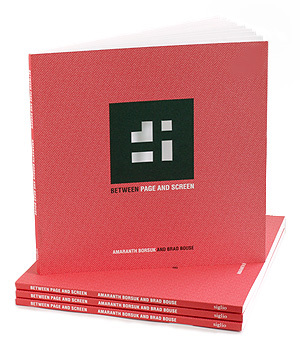 The software behind Between Page and Screen scans the video image for black squares. It examines the contents of each black square to see if it matches a pattern. When it finds a match, the software determines the black square's position in space by comparing its corners and passes that information to the animation software, producing the effect that you're holding the text in your hands. If you have multiple cameras connected to your computer, we might not select the right one automatically. To choose a camera, right-click (or option-click on a Mac) on the screen and select the correct camera from the menu that appears. 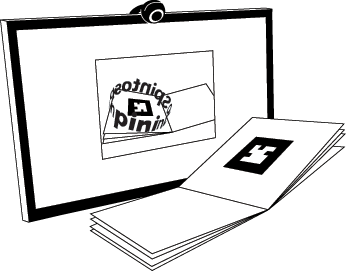 If you only see a white box with a black border and no video image, another application may be using your webcam. Please double-check that no other applications (like Skype or a chat client) are currently using your webcam, and refresh Between Page and Screen. If you're having trouble with Between Page and Screen, please let us know. Send us an email at hello AT betweenpageandscreen.com, and we'll work with you to fix the problem. We will be happy to help.